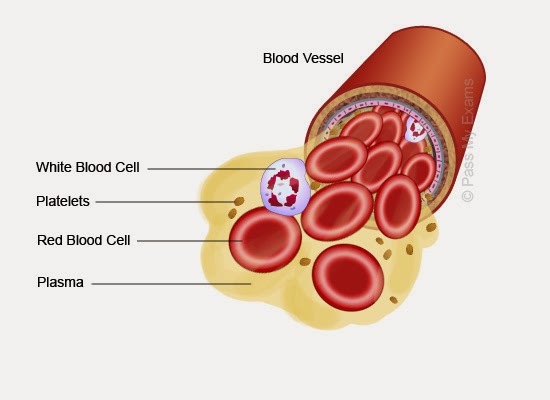 The body contains approximately 5 litres of blood and this is a mixture made up of red blood cells, white blood cells and platelets all suspended in a liquid called plasma. Very small and have the shape of a biconcave disc --> ↑surface area/volume ratio --> rapid diffusion of O2 into and out of them. Contain Hb, which combines with O2 to form oxyhaemoglobin (HbO2) in areas of high concentration (lungs) and releases O2 in areas of low concentration (respiring tissues). Have no nucleus or mitochondria. No nucleus --> more surface area to carry Hb and hence O2. Recognise virus/bacteria as being foreign and make antibodies to attack and destroy them or destroy them directly. Each lymphocyte can recognise one particular pathogen and respond to it by secreting one particular type of antibody or by attacking it. 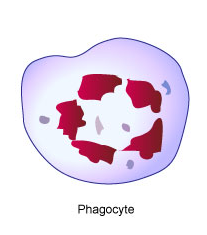 Destroy unwanted cells (damaged body cells or pathogens like virus, bacteria) by engulfing them in a process known as phagocytosis. They take the germ into the cell then digest and destroy it. Larger than red blood cells and often have a lobed nucleus. 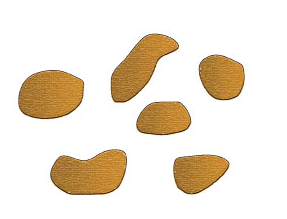 Help blood to clot by clumping together and forming a plug. Capillaries have tiny gaps between the cells in their walls. Near the arteriole end of capillary, there is relatively high pressure inside the capillary, and plasma leaks out through these gaps to fill the spaces between the body cells. This leaked plasma is called tissue fluid. 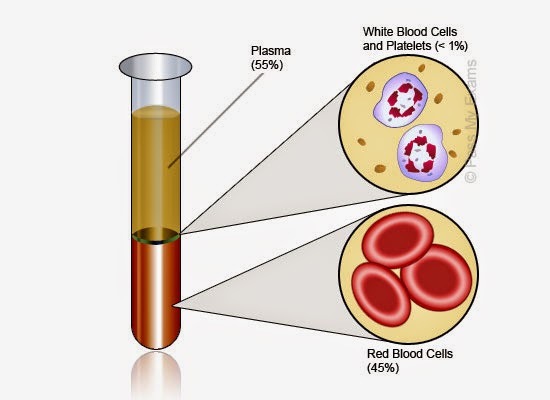 Tissue fluid is therefore very similar to blood plasma. However, very large molecules such as albumin (a protein carried in solution in blood plasma) and other plasma proteins cannot get through the pores and so remain in the blood plasma. 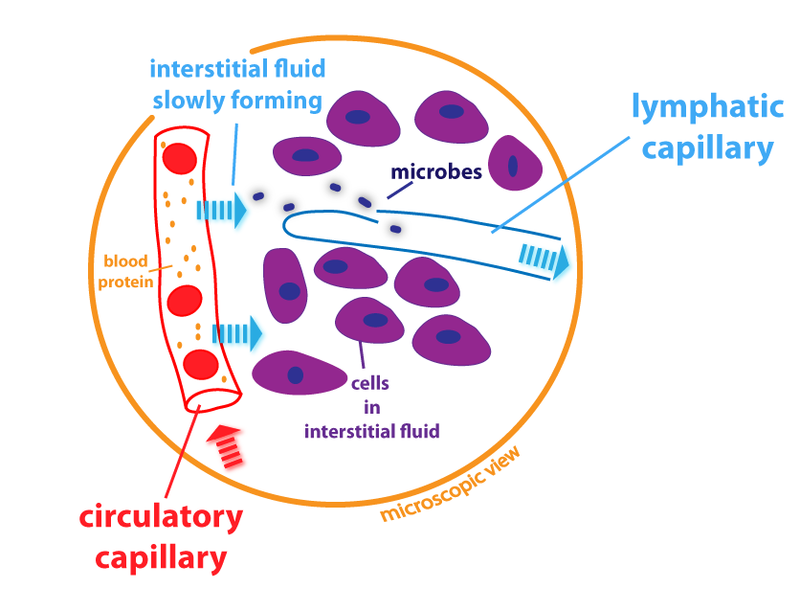 The tissue fluid bathes the body cells. Substances such as oxygen, glucose or urea can move between the blood plasma and the cells by diffusing through the tissue fluid. Some tissue fluid moves back into the capillaries, becoming part of the blood plasma once more. This happens especially at the venule end of the capillary, where bloodpressure is lower, producing a pressure gradient down which the tissue fluid can flow. However, some of the tissue fluid collects into blind-ending vessels called lymphatic vessels. It is then called lymph. 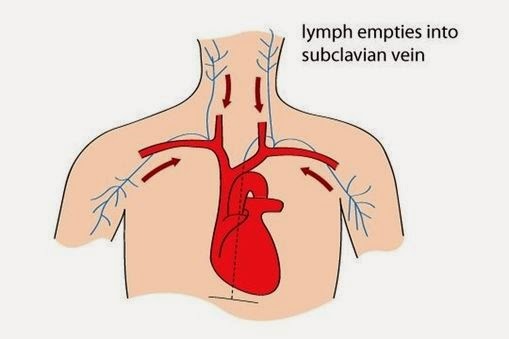 Lymphatic vessels have valves that allow fluid to flow into them and along them but not back out again. They carry the lymph towards the subclavian veins (near the collarbone) where it is returned to the blood. The lymph passes through lymphatic glands where white blood cells accumulate. 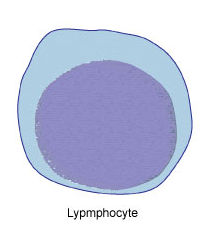 Lymph therefore tends to carry higher densities of white blood cells than are found in blood plasma or tissue fluid. and then return it to the circulatory system. 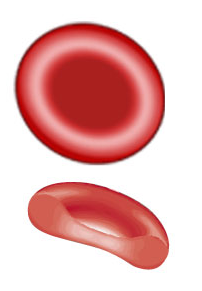 Blood is a suspension of red and white cells and platelets in plasma. When left to settle or spun in a centrifuge, blood separates into these 3 components. Tissue fluid is a colourless fluid that is formed from blood plasma by pressure filtration through capillary walls. It surrounds all the cells of the body and all exchanges between blood and cells occur through it. Lymph is tissue fluid that has drained into lymphatic vessels. It passes through lymph nodes where it gains white cells and antibodies. 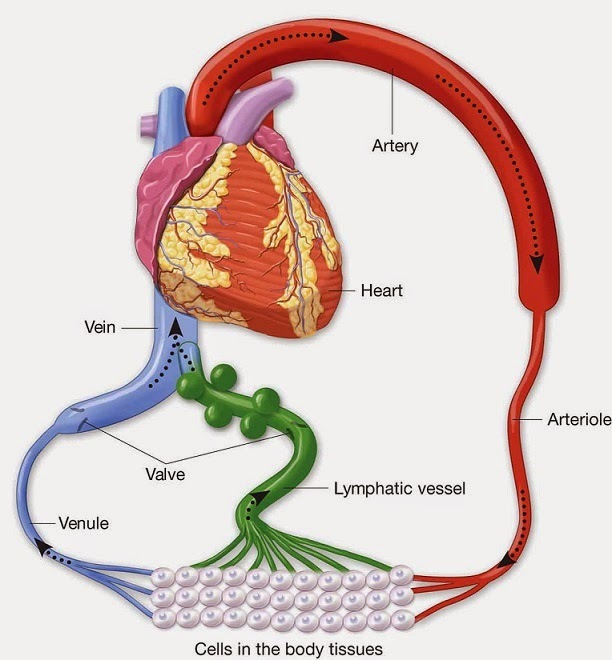 Lymphatic vessels absorb hormones from some endocrines glands and fat in the small intestine. Hb is a protein with quaternary structure. A Hb molecule is made up of 4 polypeptide chains, each of which has a haem group at its centre. Each haem group contains an Fe2+ ion which is able to combine reversibiy with O2, forming HbO2. Each iron ion can combine with 2 oxygen atoms, so one Hb molecule can combine with 8 oxygen atoms. O2 concentration can be measured as partial pressure (pO2), in kilopascals (kPa). Hb combines with more O2 at high pO2 than it does at low (pO2). At high pO2, all the Hb will be combined with O2, and we say that it is 100% saturated with O2. 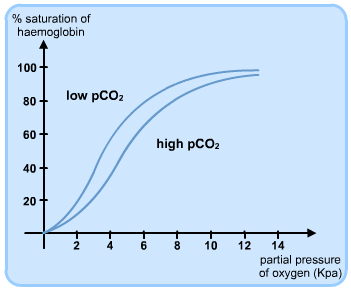 Dissociation curve - A graph showing the relationship between pO2 and the % saturation of Hb with O2. Dissociation curves show how efficient Hb is at absorbing O2 in the lungs and dilivering O2 to tissue. In the lungs, pO2 = 12 kPa. You can see from the graph that the Hb will be about 98% saturated. In a respiring muscle, pO2= 2kPa --> Hb will be about 23% saturated. --> When Hb from the lungs arrives at a respiring muscle it gives up more than 70% of the O2 it is carrying. The amount of O2 carried and released by Hb depends not only on the pO2 but also on pH. An acidic environment causes HbO2 to dissociate (unload) to release the O2 to the tissues. Just a small decrease in the pH results in a large decrease in the percentage saturation of the blood with O2. Acidity depends on the concentration of hydrogen ions. --> H+ displaces O2 from the HbO2, thus increasing the O2 available to the respiring tissues. HHb is called haemoglobinic acid. This means that the Hb mops up free H+. That way the Hb helps to maintain the almost neutral pH of the blood. Hb acts as a buffer. In areas of high CO2 concentration, Hb is less saturated with O2 than it would be if there was no CO2 present. This release of O2 when the pH is low (even if the pO2 is relatively high) is called the Bohr effect. It enables Hb to unload more of its O2 in tissues where respiration (which produces CO2) is taking place. 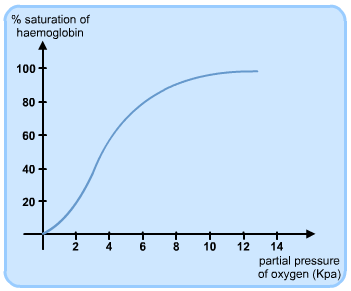 in the oxyhemoglobin dissociation curve. About 85% of the CO2 produced by respiration diffuses into the red blood cells and forms H2CO3 (carbonic acid) under the control of carbonic anhydrase - enzyme found in red blood cells. About 5% of the CO2 produced simply dissolves in the blood plasma. Some CO2 diffuses into the red blood cells but instead of forming H2CO3, attaches directly onto the Hb molecules to form carbaminohaemoglobin. Since the CO2 doesn't bind to the haem groups the Hb is still able to pick up O2 or H+. At high altitudes, the air is less dense and the pO2 is lower than at sea level -->Hb is less saturated with O2 in the lungs and delivers less O2 to body tissues. After some time at high altitude, the number of red blood cells in the blood ↑--> there are more Hb molecules in a given volume of blood. -->Even though each Hb molecule carries less O2 on average than at sea level, the fact that there are more of them helps to supply the same amount of O2 to respiring tissues. Athletes may make use of this by training at high altitude before an important competition. When they return to low altitude, their extra red blood cells can supply O2to their muscles at a greater rate than in an athlete who has not been to high altitude, giving them a competitive advantage. what does the poitive and negatives stand for in the table defrentiating btween blood , lymphs and tiue fluid? (+) means Present, (-) means Absent I guess.